Riga-Chisinau – 2640km travelled. Distance from home – 1150km. This entry was posted in Moldova and tagged Chisinau, DAAC, dubossari, dubossars, EU, Horia Brenciu, Hramul Chişinăului, kettlebell, Modern Talking, Moldova, parks, placenta, placinta, Stefan the Great, stray dogs, Wine on December 19, 2014 by Ivars Brencis. Good morning, water condensation! While still lying in my sleeping bag, which is half way open because otherwise it would transform to a portable sauna, I hear a familiar song being played by Ivar’s mobile. “Čšs, čšs, tuk, tuk, tuk! Ripo tvaika bānītis. Panākt to un noskriet var katr(i)s mazais Jānītis” (English translation would sound something like this “Cshh, cshh, tuk, tuk, tuk! The steam train is rolling down. It and be caught and outraced by even the small Johnny”). We woke up almost each morning listening to the song “The steam train is rolling down” by E.Goldstein/A.Kruklis, performed by Women’s vocal band of Latvian Radio (listen to the song on youtube: https://www.youtube.com/watch?v=yJogkSrhUrM). As soon as the song was over, you don’t have any options, you have to get up, put on your cycling shorts and start pedalling. Ba-bam, ba-bam, ba-bam, ba-bam! We were greeted by the familiar sound of the highway once we started to cycle down the road. 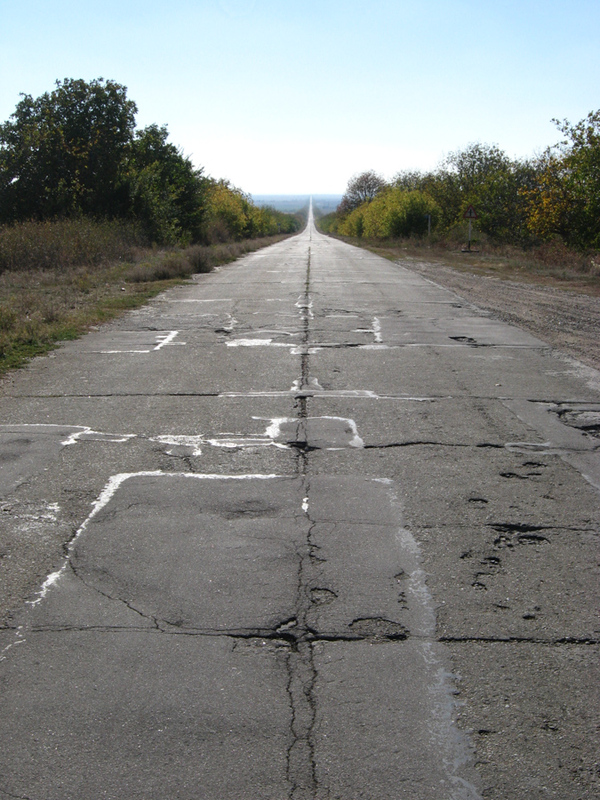 The road was built from concrete plates which were covered with a thin layer of tarmac. The problem was that nobody had actually tried to renew the tarmac surface and thus the road was lined with holes and trampolines at regular intervals. During the first few kilometres of the day, we were just listening to the disturbing noises our bicycles made each time we hit a hole. Fortunately the Ukrainian tank road did not manage to do any serious harm and the only real annoyance was that we had to stop from time to time in order to rearrange our bags as they were randomly changing their locations on the rear rack. This entry was posted in Moldova and tagged Adventure, bicycle, Expedition, How Many Roads, Latvia, Moldova, Moonshine, Riga, Russia, tourism, Transnestria, Ukraine, Wine on December 16, 2014 by Dainis Pudelis.